Need Help with Your eCommerce Business? "Are They Stealing Your Search Engine Traffic?" "Your .htaccess file can be used to redirect traffic from search engines to a thief's web site. If your site has been hacked in this way, then when someone finds you in a search engine and clicks on a link to go to your site, they are taken to the thief's site, instead. The links in the search result go to your site, just like they're supposed to. 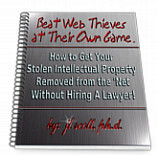 But, your site redirects the visitor to the traffic thief's site." As usual, Will gives you both the problem and the solution. Every online business owner - in fact, everyone who owns a web site needs to be aware of this! Black Friday brick and mortar sales were up $1 Billion over 2010. Sales were the largest amount ever spent on that day. We had a 24.3 percent increase in online spending on Black Friday. Online sales reached $6 Billion the week after Thanksgiving - or "Cyber-week." I understand that austerity measures get pretty damn old, after a while, and folks tend to break out. But, that doesn't explain the insane amounts of money being spent. Sure, the sale items are good - but, not that good. It's good news for online business owners, but in no way does this mean the economy, overall, is getting better. You can't have 14 million folks out of work (and, those are just the ones still collecting unemployment benefits) and have any kind of economic recovery! Millions more have outlived their benefits, and many have stopped looking for jobs that aren't there. Millions more have had their hours cut and/or their wages lowered. So, where are these billions of dollars being spent coming from? Credit cards? How are all these folks still making their credit card payments? Do people think this will stimulate the economy? Well, not if those credit cards aren't paid! And, even if they are, the money will just go to the top CEOs. We didn't have this kind of spending back in the '90s when the economy was booming. Something is afoot here - and I don't know what it is! I don't have a clue! I did wonder if millions of people are thinking this may very well be the last Christmas there's any chance of celebrating. Have that many folks bought into the "world will end on 12/21/12" claims? Really? I think this is fascinating and I'm extremely interested in hearing your ideas! Come on, people, set me straight! What's going on?